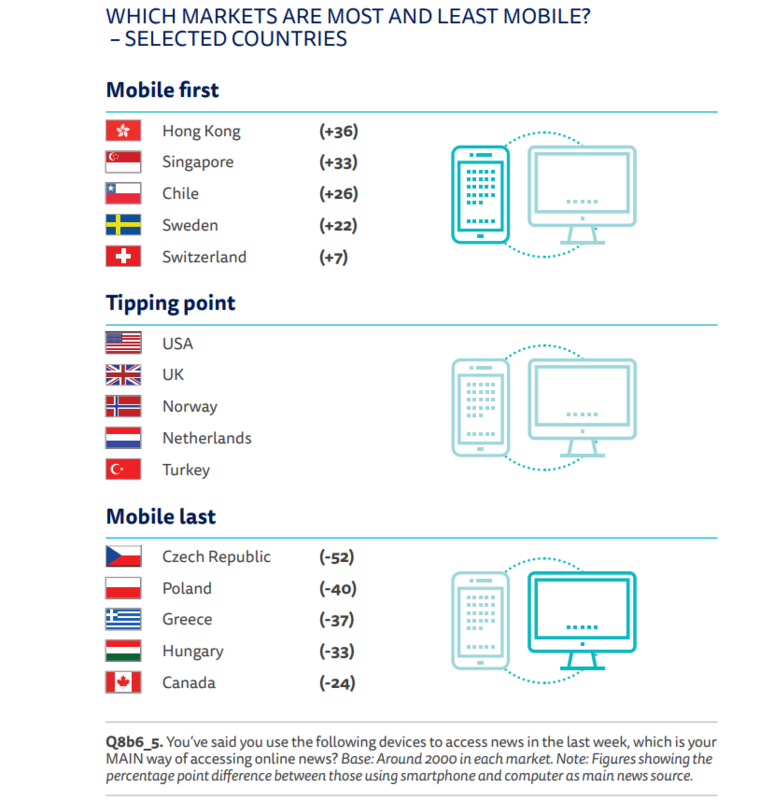 Hong Kong is the “most mobile” market when it comes to news consumption, a Reuters Institute study has shown, with a 36 percentage point difference between those using smartphones and computers as their main news source. The study also found that 31 per cent of respondents in Hong Kong only used a smartphone for news in a given week. The city is also among the markets where mobile alerts and notifications as a method of obtaining news are most popular, with 27 per cent relying on content shown on their lockscreens. Photo: Reuters Institute Digital News Report 2017. Researchers consulted more than 70,000 people in 36 markets across Europe, the Americas and Asia-Pacific. It was carried out via an online questionnaire at the end of January and beginning of February 2017. In Hong Kong, 2,015 people were interviewed. 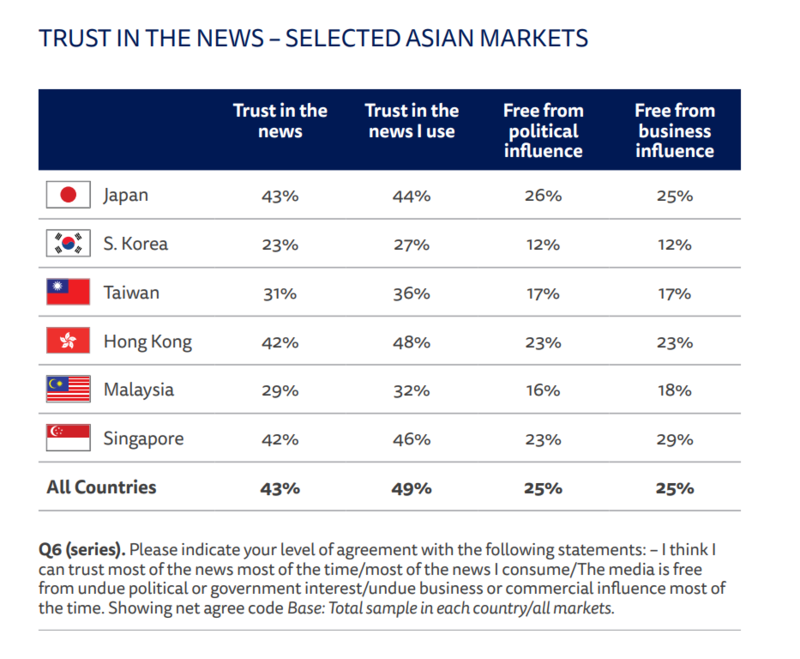 Hong Kong also ranked highly compared to other Asian markets on questions regarding trust in the news; 42 per cent in Hong Kong said they trusted the news, while 48 per cent said they trusted the news media they used – the highest out of all Asian markets. 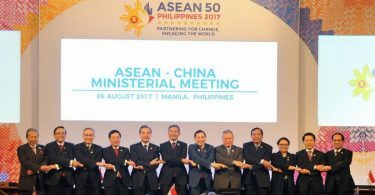 The report noted that Hong Kong “does not have a democratic system despite a ‘tradition’ of civil liberties,” and the difference in political systems between the countries affected the degree of press freedom, which in turn affected the development and significance of online media. Hong Kong also ranked third among territories where consumers pay for online news, with 21 per cent of interviewees saying they do so. 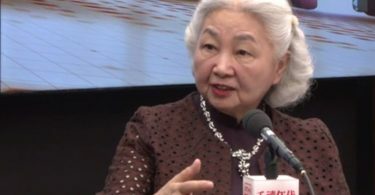 For television, radio and print, TVB News, Headline Daily and RTHK were the most popular in Hong Kong, with 71 per cent, 43 per cent and 28 per cent respectively saying they use the outlets weekly or more than three days per week. 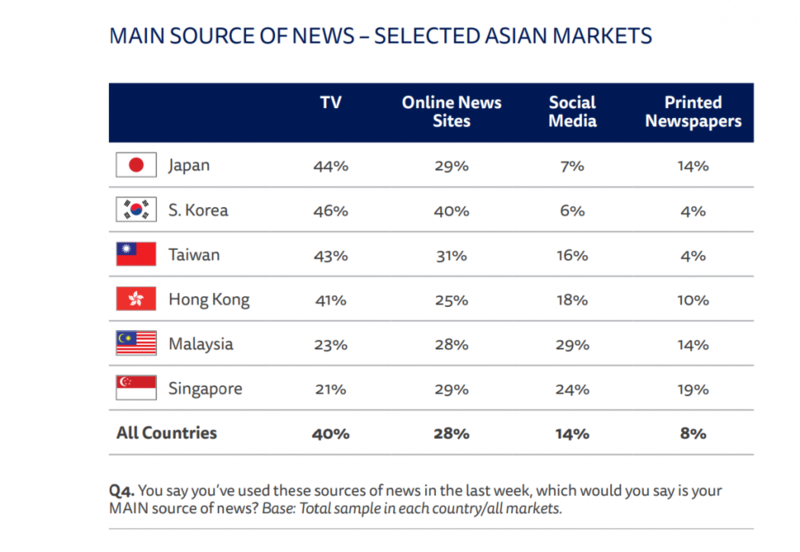 Television was the dominant news source in Hong Kong, with 41 per cent of respondents saying it was their main source of news. With regards to print, the report said: “Hong Kong newspapers have been hard hit” – Hong Kong Daily News and The Sun closed in 2015 and 2016 respectively. Only 10 per cent of the respondents considered print newspapers to be their main news source.